The weather has been spring-like, and the tie-dyed snowflakes in our kitchen no longer seem appropriate. With March quickly approaching we decided to make a fun St. Patrick’s Day craft. 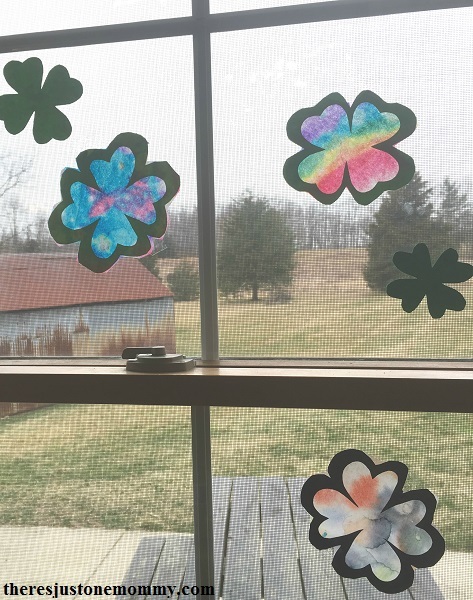 Each rainbow shamrock suncatcher is a colorful touch of spring hanging in the window. 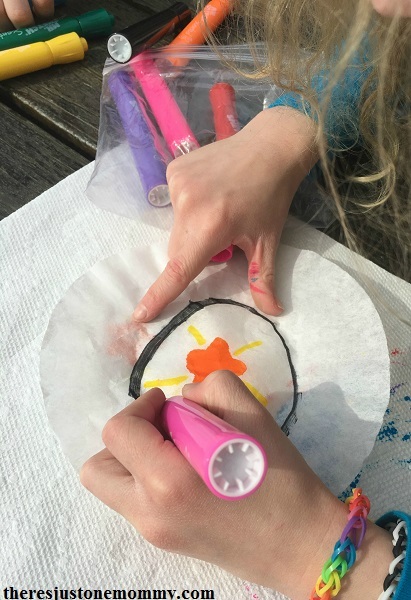 Making a colorful coffee filter suncatcher is easy enough for a toddler and fun for older kids as well. Affiliate ad links have been provided below. Once they are decorated, spread the coffee filters out on paper towels. The paper towels will help lessen the mess. 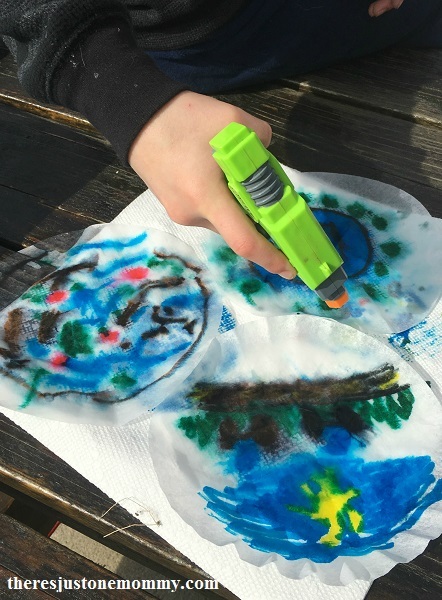 Have your child spray their design with water using their spray bottle. (My son loves this sprayer.) Watch the colors begin to swirl together. Allow the coffee filters to dry completely. 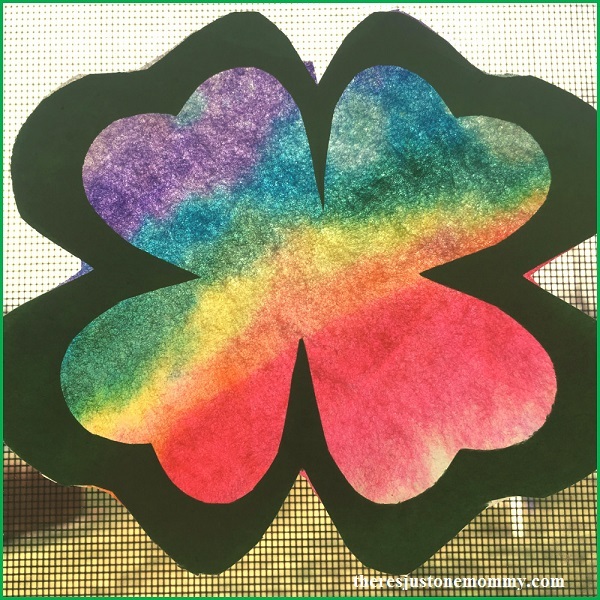 To make the frame for your shamrock suncatcher, fold a piece of construction paper in half. Then fold it in half again. Cut a heart from the folded paper, using the inner corner of the paper as the heart’s point. This will create a shamrock shaped hole in the paper. Then cut around the shamrock shape again to make the frame. We made ours approximately 1/4 inch (1/2 cm) thick. 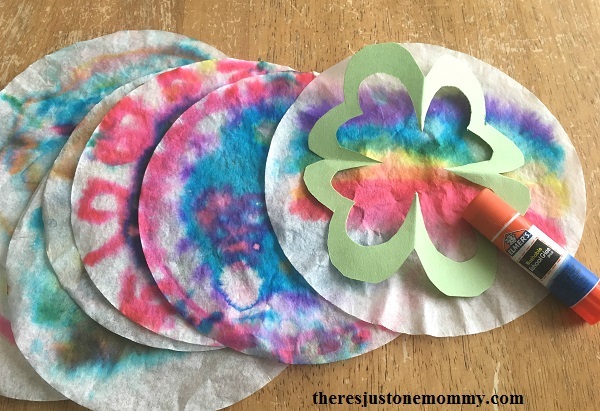 Use a glue stick to attach the clover onto one of the tie-dyed coffee filters. 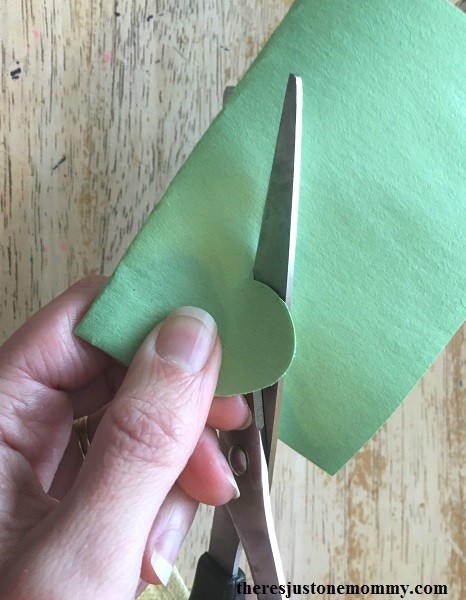 Use scissors to trim off the extra coffee filter. Then hang your four-leaf clovers on your window with clear tape. If desired, tape the solid construction paper shamrocks to the window, too. The rainbow shamrock suncatcher looks beautiful in the window. With the temperatures warming up, it’s the perfect St. Patrick’s Day craft to add a touch of spring. We’ve “painted” coffee filters like this before – so fun! I like the idea of turning them into shamrock sun catchers. Oooh I love this idea! My girls love all things rainbows, so this is going to be a hit! Thanks for sharing!